SCOTLAND WALES ENGLAND Win A Map! Welcome! Here you'll find the ultimate list of Britain's most beautiful landscapes and finest locations for a great adventure. The buttons below take you to each location's page with eye-popping pictures, videos and other glorious blurb. Perfect inspiration for your next Great British adventure, and the perfect digital accompaniment for our Joyously Busy Great British Adventure Map. Britain’s very best adventure locations, including our Top 50 selection on this page, are the subject of the Joyously Busy Great British Adventure Map. Available in 3 formats (fold-out, flat or framed) from £14.99. Back To Top WALES ENGLAND Win A Map! The glorious island of Arran is Scotland in miniature, a perfect adventure spot with its own highland and lowland areas. Alongside some great mountains, there's also a fantastic coastal road and a separate walking route, both of which circle the entire island. This is not just Britain's highest mountain, but the perfect highland setting for all manner of adventures using Fort William as your base. Hikers, climbers, skiers / ski tourers, cyclists, mountain bikers, paddlers, campers and road trippers are all spoiled for choice here. Britain’s largest national park and home to 4 of the 5 highest peaks in the land is an adventurer's paradise. Remote, wild and home to some of Britain's - and the world's - finest landscapes: the Northwest Highlands are legendary. Galloway Forest Park is known as the "Highlands of the Lowlands". It's big, it's quiet, and besides an enormous number of trees it also has some lovely mountains like Merrick (843m) and the other 'fingers' of the Awful Hand range. Britain's most dramatic and iconic set of valleys, boasting famous peaks like Buachaille Etive Mor (1022m), the Three Sisters and the Aonach Eagach ridge, has the perfectly contrasting neighbour: wild and empty Rannoch Moor. A remote but much-lauded valley: Sir Walter Scott called it the "longest, loneliest and loveliest glen in Scotland". It's not just a beautiful place - it's flanked by Munros aplenty so there are mountain-shaped thrills to accompany all that gawping. Walk, cycle or canoe coast-to-coast via four connected lochs from Inverness to Fort William. A Great British journey along a geographical feature that's visible from space. 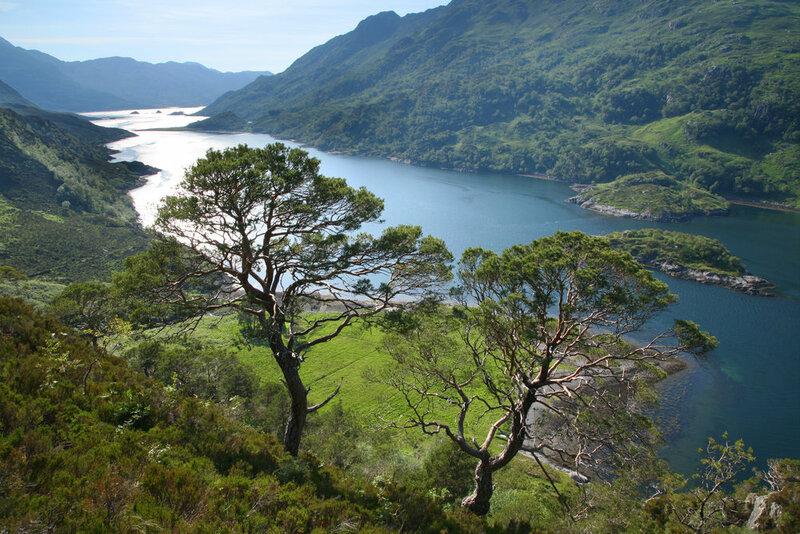 A wild peninsula sandwiched between Lochs Nevis and Hourn, Knoydart is only accessible by boat or a very long hike. It is well worth it when you get there and enjoy a drink in Britain's most remote pub. The Highlands in miniature: loads of large lochs, mighty Munros, rampaging rivers and a couple of forest parks too for good measure... and only an hour from Glasgow. A great road trip by car or bike, with eye-popping scenery all around, such as the Queen's View of Loch Tummel and the delightfully conical peak of Schiehallion. 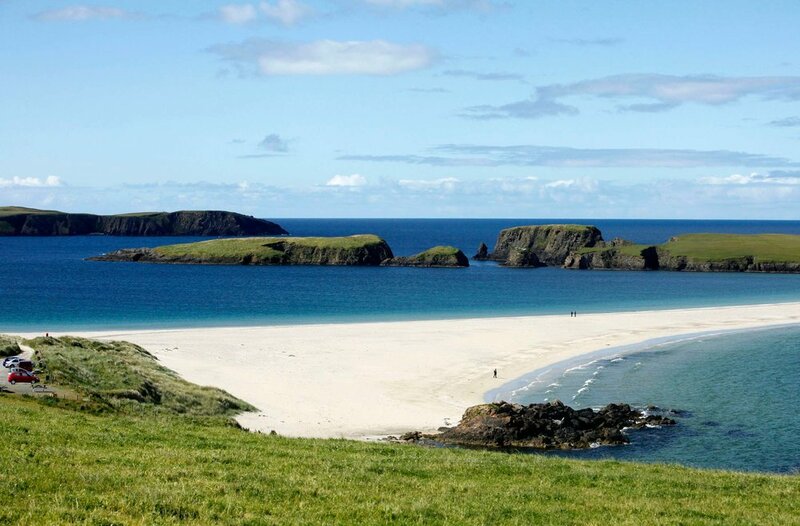 Beaches so white they're referred to as the Silver Sands, Britain's shortest river and deepest loch, the most westerly point on mainland Britain, this barely-pronounceable place has it all... and a spectacular arrival via the Road to the Isles or West Highland Line train. A disgracefully impressive collection of highlights: great sandy beaches, colourful Tobermory, Fingal's Cave, magical Iona, some enormous cliffs and Mull's imposing mountain, Ben More. 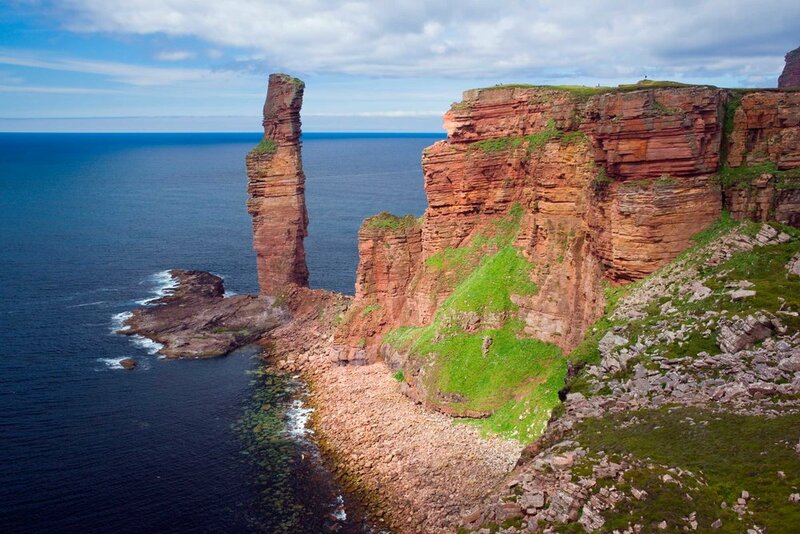 70 islands (20 inhabited) with loads of lovely sandy beaches, pre-history galore and legendarily good names for things like Skara Brae, the Dwarfie Stane, the Old Man of Hoy and the Ship of Death. Small, low-lying and utterly alluring islands joined by causeways and ferries, the Outer Hebrides are home to some of the world's finest beaches, including one which doubles as a runway for what's possibly the world's best airport. Slow down! Don't zoom past the Borders in your rush to the Highlands. Some of Britain’s very best viewpoints are here, including Scott’s View (Sir Walter's favourite), and no less than 4 great trails, Scotland's famous long-distance walking routes. The very end of the land, with Britain's northernmost point (Out Stack) the finest of destinations. There's also Foula’s ginormous cliffs, Fair Isle (the remotest inhabited part of Britain), the northern lights and 1,700 miles of coastline with many golden sandy beaches. It sounds heavenly, and it is. Skye's scenery is among the most impressive in Britain, with the Black Cuillin mountain range dominating from every angle and grand adventures to be had all around this spectacular island. Wester Ross has some of Britain's finest and most remote scenery, including a large, wild chunk known as "the last great wilderness of Scotland" and the impressive peaks of Slioch and An Teallach. BACK TO TOP SCOTLAND ENGLAND Win A Map! Anglesey, Wales' largest island, and the Lleyn peninsula, just to the south on the mainland, are shielded from the masses by Snowdonia, but they're almost entirely AONB thanks to a beautiful landscape and coastline. Great for adventures of all varieties, especially those involving water. The mighty Brecon Beacons are made for adventure. Huge, striking hills, lots of lakes and waterfalls, and - of course - Lord Hereford's Knob. Britain’s first AONB, this 19 mile-long peninsula in south Wales has a beautiful coastline and beaches including Rhossili Bay, Worm's Head and Three Cliffs Bay. A surfing paradise and feast for the eyes. A beautiful spot in north Wales that's quieter than its famous neighbour, Snowdonia, but no less appealing: excellent hills in the Clwydian Range, wonderful watersports potential on the Dee, and a World Heritage site in the Pontcysyllte Aqueduct on the Llangollen Canal. 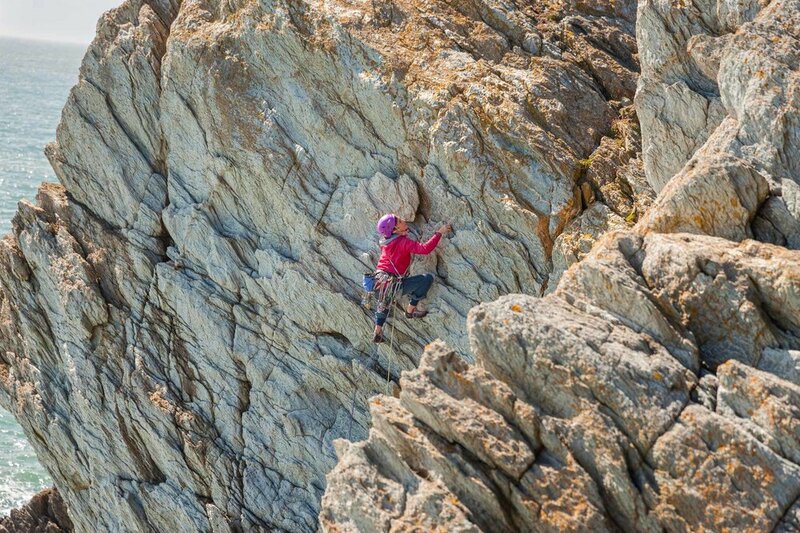 Not only is Pembrokeshire an absolute corker of a coastline, it's also a natural playground – in the water, and out - and Britain's only all-coastal national park. Snowdonia has it all: not only the highest peak in Britain outside the Scottish Highlands, but more iconic mountains (Cader Idris, Tryfan, the Rhinogs, the Glyders), hiking and mountain biking routes, forests, waterfalls and beaches than might be considered strictly necessary. For a laid back float down a river, you may struggle to do better than canoeing through the beautiful Wye Valley. BACK TO TOP SCOTLAND WALES Win A Map! Mellow pootling! Adventures don't get more laid back than floating around this series of shallow rivers and lakes, Britain's largest protected wetland. 322 square miles of lovely chalk downland only a chaffinch's guff from London, the Chilterns span bits of Oxfordshire, Buckinghamshire, Bedfordshire and Hertfordshire. Which is tough to say even without a mouthful of crackers. Cornwall isn't just the start / end point for many Great British adventures: it's also a proud peninsula with more brilliant beaches per mile than almost anywhere. The setting for Hound of the Baskervilles and War Horse has oodles of atmosphere, bronze age relics galore, plenty of wild camping options and all manner of cycling, hiking and watery fun. Dorset's spectacular beaches and coastal features like Durdle Door, Lulworth Cove and Old Harry Rocks are linked together on the South West Coast Path to stunning effect - a cracker of an adventure playground. Exmoor: a beguiling mix of rocky river valleys, big dark cliffs, an enjoyably empty section of higher moorland and great roads including the Atlantic Highway, with its views across the Bristol Channel to Wales. Flat and largely unsung, the Fens of Cambridgeshire and Lincolnshire are a vast, otherworldly land of parallel lines and lanes perfect for cycling and other horizontal adventures. Get some history with your adventure! Hadrian's Wall is the largest Roman artefact anywhere in the world, stretching 74 miles from the Solway Firth in the west to the banks of the Tyne in the east. A miniature England lounging about in the Channel off the Hampshire coast, with a great road trip and cycling route around its perimeter. A low-lying archipelago 28 miles west of Cornwall, with a totally tropical ambience, white sand beaches, clear blue waters and a fun-sounding name. A perfectly-proportioned arrangement of high hills and deep glacial lakes, and one of Britain’s best-loved adventure locations. The New Forest in Hampshire is Europe's biggest area of heathland, with great walks, cycling routes and views to the Isle of Wight... plus loads of wild horses strolling around nonchalantly wherever they like. Two lovely AONBs for the price of one, ridiculously close to London: the Surrey Hills, covering a quarter of the county, and the Kent Downs, stretching from the Surrey border to the white cliffs of Dover. All very quintessential. Flat and spectacularly sandy, Norfolk's northern coast is very good. Walk the whole lot on the Norfolk Coast Path and enjoy views that go on and on. Bootiful! Britain's largest expanse of heather moorland, the North York Moors also has some tremendous hills, beaches and views. England’s "last great wilderness", Northumberland national park is mostly wide open moorland, bounded by Hadrian's Wall to the south and the Scottish borders to the north. It's the least populated area of the country, and the largest area of protected night sky in Europe. Northumberland allegedly has more castles than any other county in England, and many of the finest - such as Dunstanburgh, Warkworth and Bamburgh - stand guard over the stunning coastline, which boasts great beaches, Holy Island / Lindisfarne and top coastal nature reserves. The spiritual home of the national parks movement has great hills, wild and spectacular scenery, impressive driving / cycling roads, caves in abundance and some of England's finest adventure potential south of the Lakes. Britain's most iconic waterway, from its Gloucestershire source to its London estuary. Walk it, float down it, cycle near it - a classic British journey. 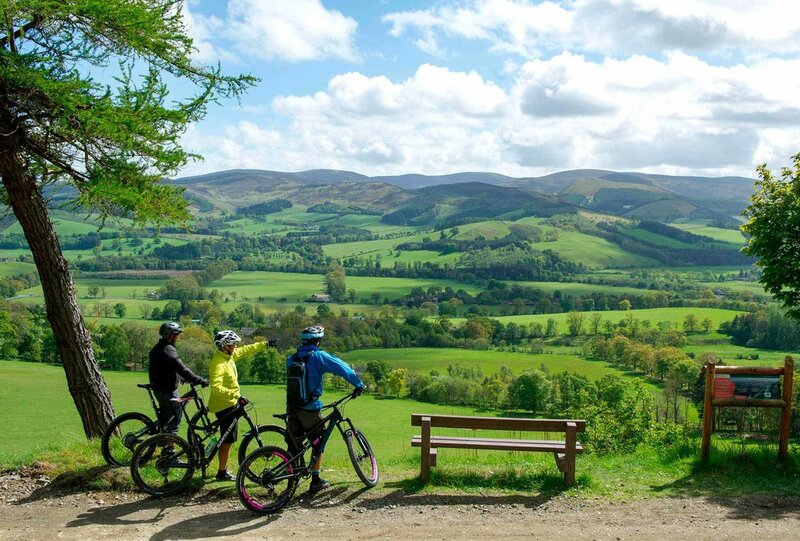 Situated in the Welsh Marches, this lovely but sometimes overlooked part of Britain includes the Shropshire Hills AONB, a World Heritage site at Ironbridge, great long-distance walking routes (Offa's Dyke Path) and cycling / mountain biking options galore. Britain’s only national park in the south-east spans 87 miles of chalk hills from Winchester to Eastbourne, including a classic walk along the South Downs Way and the white cliffs of the Seven Sisters. The Suffolk Coast and Heaths Area of Outstanding Natural Beauty is 155 square miles of unspoiled, wildlife-rich estuaries, ancient heaths, and fine coastline. It doesn't so much scream adventure as whisper it. The Yorkshire Dales national park is the centrepiece in northern England’s embarrassment of natural riches, with the Lake District to the west and the North York Moors to the east. A proper adventure location and some of England's best scenery. Enter your email address to be included in our regular prize draw - prizes include our Marvellous Maps and other wonderful things! Liking the cut of your jib - thanks and happy adventures! Take this ludicrously quick survey to let us know where in Britain you've been and where's next on your list... and you could win BIG!